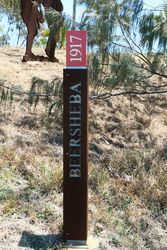 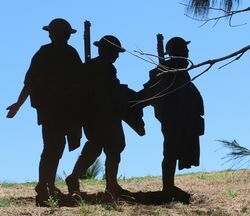 A memorial precinct commemorates the centenary of ANZAC and those who served in World War One. 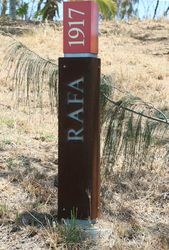 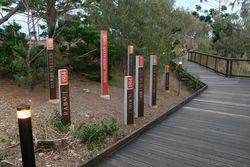 The precinct was developed over four years with funding was received through the ANZAC Centenary Grants Program. 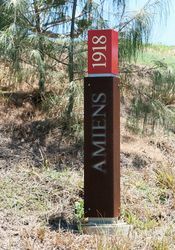 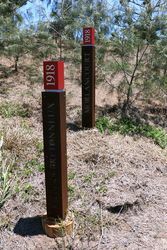 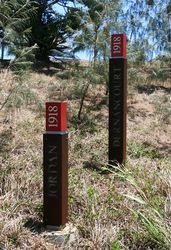 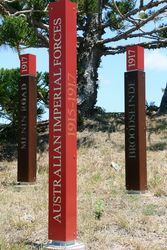 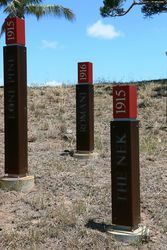 In August 2011, long standing member of the RSL Sub-Branch and resident of Emu Park, Ross Coulter, designed an inspiring concept plan for the proposed Centenary of ANZAC Project. 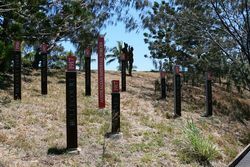 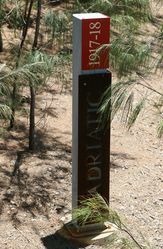 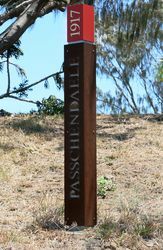 The location was the Emu Park headland foreshore in the vicinity of the RSL Memorial Hall and The Singing Ship monument. 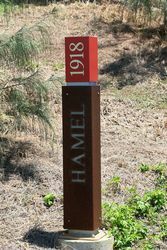 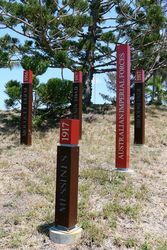 The Emu Park Sub Branch and Regional Council endorsed and adopted the plan as a major Centenary of ANZAC Commemorative Project. 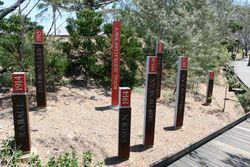 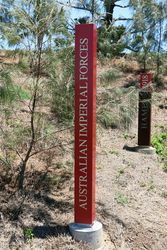 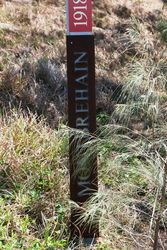 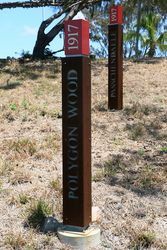 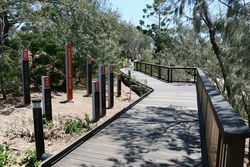 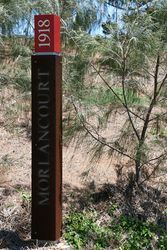 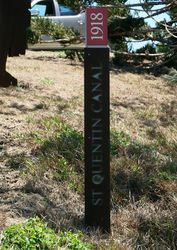 The precinct includes a reflective memorial boardwalk dedicated to the memory of the original ANZAC's who fought and died in World War One. 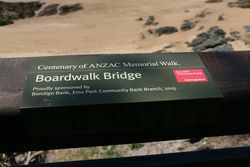 The boardwalk and its gateway gallery entry will be the focal point to ‘The Centenary of ANZAC Memorial Walk’. 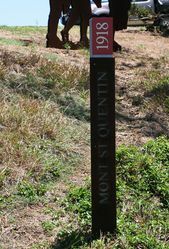 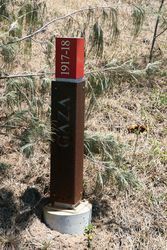 The walkway which is approximately 175 metres long, provides a timeline of World War One`s many major battles of war. 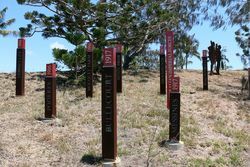 The gallery contains interpretive works telling the stories of how the war began, the story of Gallipoli, the legend of ANZAC, the details of the Gallipoli campaign, the Somme, Fromelle, the Lone Pine battle and many other campaigns. 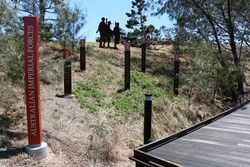 The Memorial Walk ends with a viewing deck below the Singing Ship, the entry Memorial Gateway and Orientation Gallery which incorporates artwork telling the World War One story and a Foreshore Path connecting to the Memorial Court Precinct at the end of Emu Street.